The Adventuredome, America's largest--and the Strip's only--indoor theme park features the world's only indoor double-loop, double-corkscrew roller coaster, an IMAX Ridefilm unitizing state-of-the-art motion-simulator technology, and scores of other exciting rides. Three casinos feature 2,000 slot and video machines, 80 table games, including single-deck blackjack, roulette, 10-times odds on craps, specialty games, a race and sports book, and a poker room. The world's largest buffet is just one of the dining options on site; others are the family-style pizzeria, snack bar, and award-winning steakhouse. A wedding chapel, three outdoor swimming pools, and a shopping area round out the hotel's offerings. The Circus Circus Manor Motor Lodge is made up of five three-story buildings approximately a half-block behind the main casino with easy access to all main buildings (via an enclosed, moving walkway) and convenient parking. 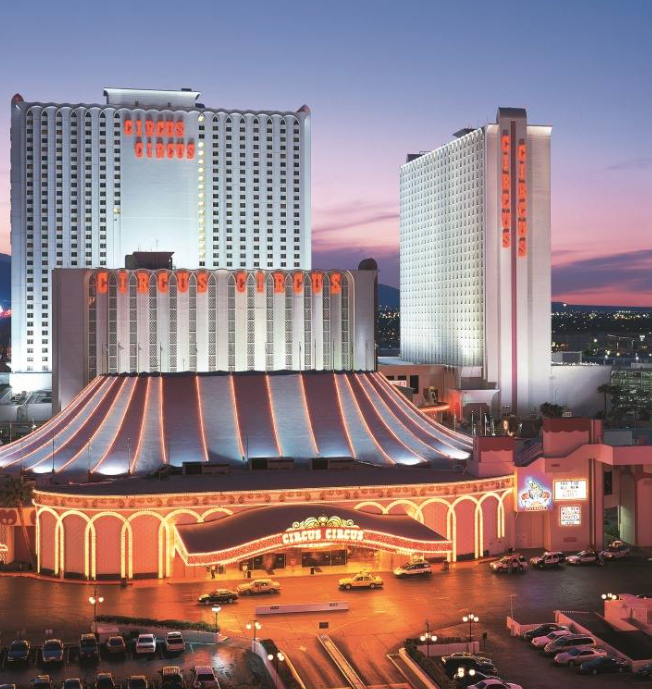 Circus Circus charges a daily resort fee of $16.95+tax, which will be billed to your room account. It includes fitness center access, and wireless high speed Internet.